April 2017 - For colleges and training centers interested in providing Direct Digital Control (DDC) system training, Contemporary Controls recommends using the BAScontrol22 unitary controller and the free Sedona Application Editor (SAE). The BAScontrol22 is an ideal controller for training technicians on programming DDCs and use of unitary building automation controllers. The BAScontrol22 provides eight universal inputs, four binary inputs, four analog outputs and six binary outputs (relay) which can be used for most unitary control applications. The BAScontrol22 has two 10/100 Mbps Ethernet connections which provide a simple connection to most PCs or a simple connection to a Wi-Fi network through a commonly available access point or Wi-Fi bridge. By having two Ethernet connections, one can be used for the student's PC and one can connect to an Ethernet switch which interconnects all of the BAScontrol22 units in the classroom. Switches can be cascaded to support more BAScontrol22 units. This would also allow the teacher's PC to communicate to all of the BAScontrol22 units for assistance and examination purposes. When using SAE the student will drag and drop components onto the screen and immediately see their effect. This "live" aspect of Sedona makes it one of the simplest to use languages for programming unitary controllers. The Contemporary Controls EISK8-100T can be used to interconnect the BAScontrol22 units in the classroom. It is DIN rail mountable and 24VAC powered for simple installation and mounting in a standard building automation enclosure. This also represents what is commonly used in the field. 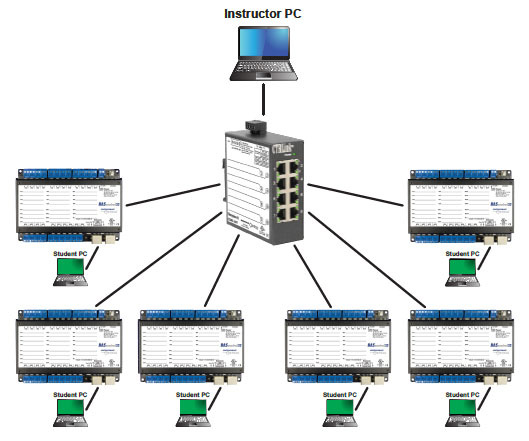 The EISK8 units can be cascaded to interconnect all of the BAScontrol22 units in the classroom along with the instructor's PC. Download "Building Automation Training with BAScontrol22" (PDF) to learn more.